Ibiza is one of Spain's top holiday destinations. The beautiful sand beaches that border the blue waters of the Mediterranean are the perfect place to relax and soak up the sun. 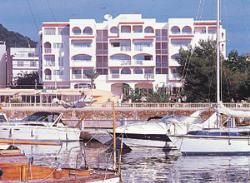 In the middle of the town of Santa Eulalia is the famous Es Pueto Resort complex, a lovely, well-managed resort located just five minutes from the beach. The wonderfully decorated two-bedroom, two-bath units are impeccably furnished, and you can buy one of these Ibiza timeshares for sale to secure your holidays at this popular destination. Renters and owners enjoy full access to all the resort's amenities. Shops and restaurants abound, and there are countless ways a family, couple, or newlyweds can have fun in and around the area. It's the kind of place where the best vacation memories are made. Every timeshare unit at Es Pueto Resort is configured with two bedrooms, and each unit features two full baths. The kitchens are fully equipped with the essential appliances, and the living and dining areas are complete with comfortable furnishings. The units are air conditioned, contain a washer and dryer, and come complete with TV, satellite reception, and entertainment system that includes a DVD player and radio. Each unit has its own private balcony, and most of these terraces overlook the downtown area, waterfront, and marina. Gift shops, restaurants, and nightclubs are just a short walk from the resort. Owners who buy Ibiza timeshares for sale at the Es Pueto Resort enjoy full access to the resort's gym, outdoor pool, on-site restaurant, and full-service sauna. The resort also contains a game room where guest enjoy table tennis, darts, and other fun games. The resort staff can help plan things like sightseeing trips, and can also help arrange for equipment rental when it's time to go scuba diving, snorkeling, or sailboarding on the waters of the Mediterranean. This resort offers guests the best combination of elegance and a relaxed atmosphere. There's nothing quite as romantic as a Mediterranean holiday, and the Es Pueto provides the perfect jumping-off point for exploring the island of Ibiza. Contact Es Pueto Resort Specialist Today!